Our niche is that DPW only offers natural media, original, fine art for sale, which means you can not post reproductions to DPW. You can, however, add custom print pages to your DPW Gallery website where you are welcome to sell giclées and other reproductions. Important: One important difference between these prints and your fine art, though, is that the prints on your print pages will only appear in your DPW Gallery website and not anywhere else in DPW. Another difference between prints and your fine art and any store items you may have for sale, is DPW does not currently handle the sale of your prints directly on DPW. 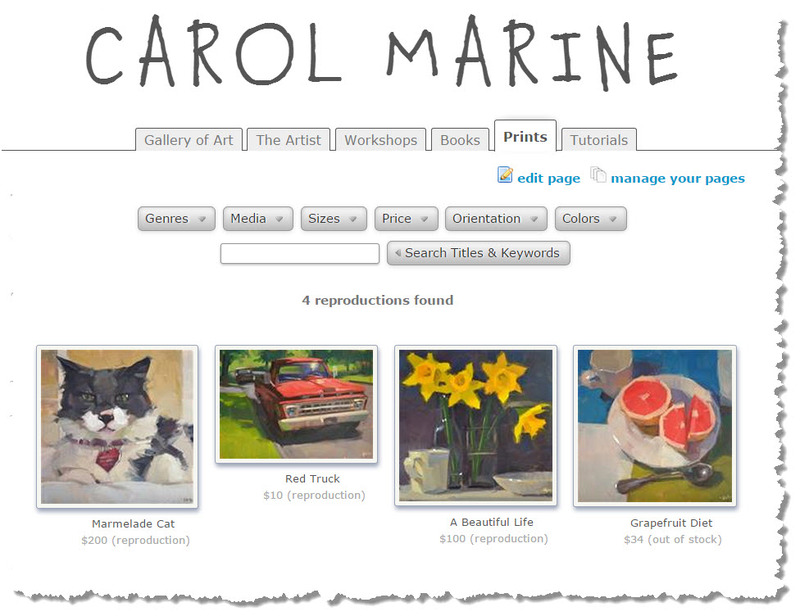 Most artists rely on a service, such as FineArtAmerica.com or Zazzle.com to produce and sell their prints on demand. When you create a print in DPW, you will need to enter a URL to the page on the external website that will handle the ordering and sale of that print. In the future this will change and it will be an option to have DPW handle the sale, as it does with your fine art and store items. As a work around, you can enter your prints as items on a store page, if you want. The format of a store page isn't as well suited to prints as a print page, however you may find it works well enough. How many Print Pages can you have? Your custom pages will show up as tabs on your DPW Gallery, along with your Gallery of Art, and The Artist tabs. You are able to have as many pages as long as the pages' tabs can visually fit at the top of your Gallery. 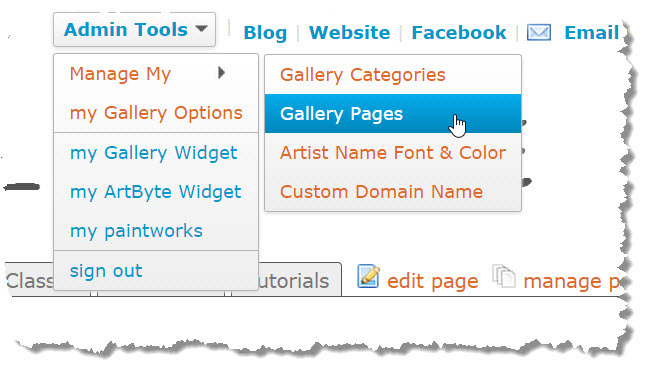 Selecting the Admin Tools -> Manage My -> Gallery Page menu item opens the Manage your Gallery Pages window where you can add, edit, and delete event, print, and item pages. You can create one page for all your prints, or a separate page for each type of print or subject matter, etc. It is completely up to you on how you organize your pages. You can also drag and drop the pages in the page list shown below to change the order in which their tabs appear in your Gallery. Once you have created one or more pages, you can use the shortcut links on any of your custom pages to open the Manage your Gallery Pages window, edit your page, or edit and delete items on the page. You can also hover your mouse over one of your prints' thumbnails and click the little pencil icon that appears to edit a given print. You can create, edit, and delete your pages in the page management window shown below, which opens when you click the manage your pages link in your gallery. You can also drag and drop the pages in the list to change the order in which their tabs appear in your Gallery. You can create one page for all your prints, or a separate page for each type of print. It is completely up to you on how you organize your pages. Clicking on either the edit page link on an existing print page or the pencil icon for a page in the Pages Management Window shown above, opens the Prints Page window, from where you can create, update, or delete your prints. You can also drag and drop the prints in the list shown below to rearrange the order they will appear in your print page. You can check the Hide check box when creating or editing an print. Unlike pages, items, and events, prints are not visible to either you or the buyer when hidden. A short descriptive title. No need to be verbose here, as you have the Description field for that. You can enter an optional Item Id, for your own tracking purposes, if you would like. This is the Price of the print, before any shipping and sales tax. Use this field to describe the specific nature of your print - whether it is a giclée, if it is on stretched canvas, etc. Include in the Description ="font-weight:>anything and everything you feel is important to describe your item. Be sure to enter keywords in the keyword tab. 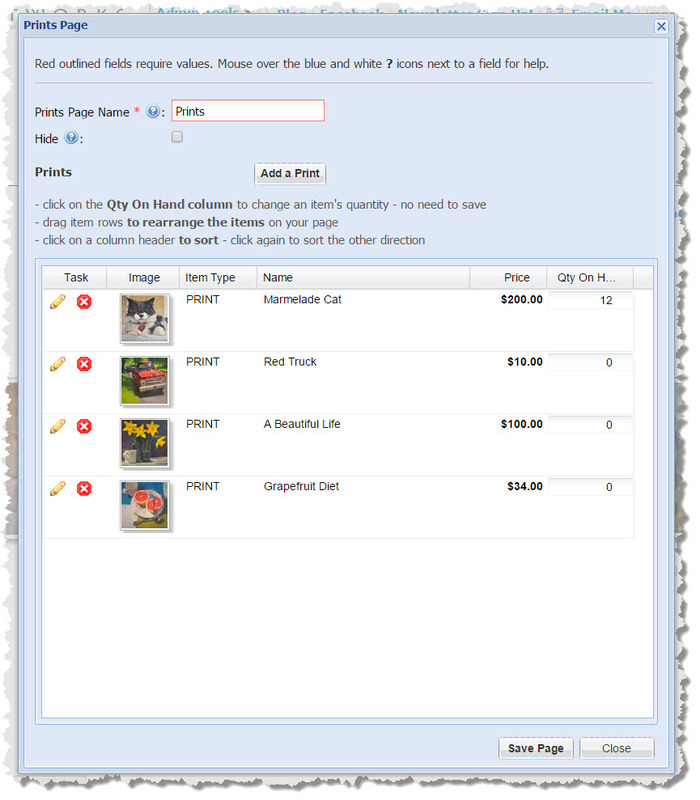 As with your fine art, keywords will help buyers search your prints on your print page. Of course, this is only valuable if you have a large number of prints. A good representative image of your print. Be sure to make your image be at least 600 pixels tall or wide. Larger, up to 1,000 pixels, is best for zooming. You do not have to have DPW track your print's Quantity On Hand, however if you do, DPW will show the words out of stock underneath the print if the quantity on hand is set to zero. 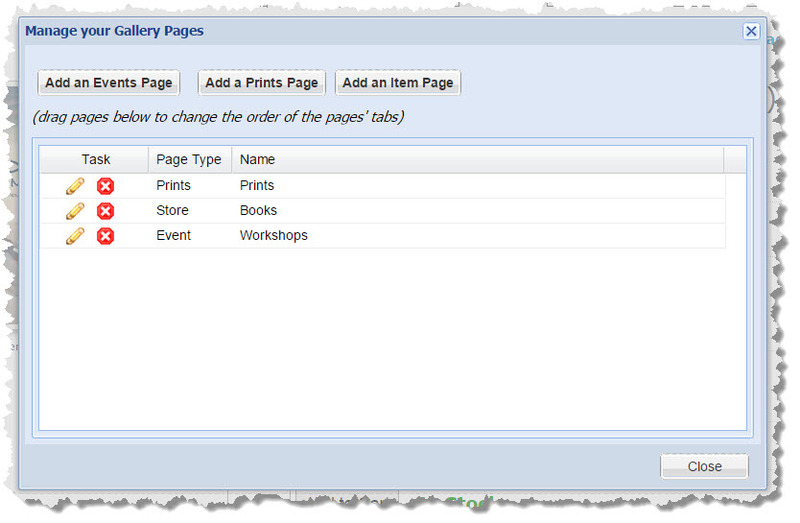 You can change an item's quantity on hand both in the Print Create/Edit window or in the print list in the Print Page window. Posted - Sat, Mar 28, 2015 at 8:06 PM. This article has been viewed 8524 times.